The Eco-Cubby book features designs and stories by children and their teachers who engaged with the project exploring environmental issues and sustinable living. The launch will be followed by a panel discussion about sustainable design and children, with speakers Ben Statkus (Director, Statkus Architecture), Clare Newton (Associate Professor in Learning Environments, University of Melbourne), Stephen Wigney (Principal Berwick Fields Primary School) and Paul Porjazoski (Director BENT Architecture). Regional Arts Victoria proudly partnered with the City of Melbourne to create the Eco-Cubby project, with Kelly Boucher as Project Coordinator. This innovative project began in 2009 and has visited towns across the state from Nangiloc to Bundalaguah to Mallacoota. 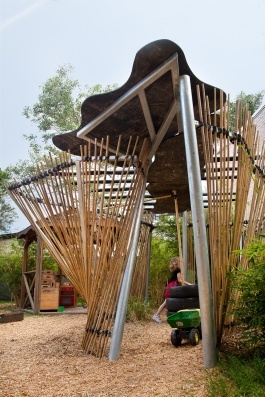 Eco-Cubby allowed architects and designers to work with schools and communities to explore concepts of sustainability through a hands-on making process. In 2016 we are very excited to present Eco-Cubby with Kelly, who will continue to deliver the project to schools through the Education & Families program. Hosted by Esther Anatolitis, creator Kelly Boucher will launch Eco-Cubby, a new book showcasing her work with children as designers of sustainable architecture.